Rolling my eyes, I would think back to what I had actually consumed over the summer: fresh eggs still warm from the hen; new potatoes smelling of buttery sweetness and thick, earthy cream the color of buttercups from the cows down the road; mint picked fresh from the garden; and tiny wild strawberries, fragrant and bursting with flavor. Bad food? What bad food? Unfortunately, this misconception is still rampant. Even within the U.K., not many people are aware of the beautiful bounty being cultivated in their own country. In this age of pre-packed, pre-sliced, frozen, convenience comestibles, traditional ways of producing and consuming food are often seen as anachronistic, expensive and, quite simply, unimportant. Neal’s Yard Dairy is changing that with regard to one of our most beloved food categories: cheese. Started in the early 1980’s as a small cheese shop in London, Neal’s Yard Dairy has become the preeminent champion of British cheese. Working with 40 cheesemakers from the U.K. and Ireland, they not only sell British farmhouse cheeses — what they call “territorials” — but also work to improve the cheese’s quality, age them to perfection, and expand their global reach. When I get my weekly call from my Neal’s Yard sales rep, I know that she’s up to speed on each and every batch and wheel in their aging caves. Unlike a lot of cheese businesses, the Neal’s Yard sales and export team interact with and taste through every batch of cheese that comes into their warehouse. In fact, they share the same space as the aging caves, under a railway bridge on the south bank of London. Most of the time, when you, as a cheese buyer, talk to a salesman, they sit in their office and read clips about the different cheeses they sell. If you ask them what’s tasting good at the moment, they can’t really answer you because they never, or very rarely, interact with the wheels that are heading to your store. Every Monday morning, the whole sales team goes through the caves and tastes wheel after wheel, deciphering what is ready to move out, and which market it would likely sell well in. I joined them in their routine, learning for myself the differences between cheeses going to the London Neal’s Yard shops versus cheeses going to Europe versus those going to the US. Cheddars for the American market focus on punchy, zingy flavors — bright, younger cheeses with a fair amount of internal moisture that will last the four- to six-week journey across the Atlantic. In Europe, however, they like their cheeses a bit more nuanced — earthy, grassy tones from older, more sophisticated wheels. For the cheeses heading to the London shops, they have a similarly mellow yet complex profile, with a good deal of nuttiness, and are ready to eat now. Not a week from now, not a month from now, but now. Cheese is an ever-changing product — just because it is “done” aging doesn’t mean that it will just stop evolving either in flavor or texture. That means that a wheel might be perfect when it leaves the aging cave, but in the time it takes to get to the customer, even if the travel conditions are perfect, it could smell, taste, and feel entirely different. Add in the fact that working with artisanal, hand-crafted cheese means that every wheel is slightly different depending on the milk used the day it was made, the temperature, the humidity, and multiple other factors, and you have a lot of complicated elements all contributing to the flavor and texture profiles of every single wheel of cheese. As a customer who lives an ocean away, I’ve never received an “off” wheel or a wheel that I feel is impossible to sell to my American customers. Constant, evolving knowledge of and contact with their product is the name of the game for Neal’s Yard and it pays dividends. During my trip to follow the cheesemakers who supply Neal’s Yard, the company’s Dairy Sales Director, Jason Hinds, and I went rambling along twisting country roads in the back of a very comfortable station wagon. Neal’s Yard regularly visits, consults with, and hand selects cheeses from their producers, as frequently as once a month. Not only does this ensure the quality of the cheeses in their shop and in their exports, but it also educates them on trends and process, and cements relationships. Our first stop was at Montgomery’s Cheddar in Somerset. Greeted by James Montgomery, a tall, friendly figure clad in an comfortable looking woolen sweater and Wellington boots, we were just in time to to watch the cheddaring process for that day’s batch of cheese. While we watched the cheesemakers cut the knitting curds into blocks and stack them on top of each other, Montgomery talked about the evolution of his cheeses and the pressure to make cookie-cutter, supermarket friendly blocks of the stuff. A third-generation cheesemaker and farmer, Montgomery grew up less than a quarter mile away from the dairy in which we now stood, and learned the ins and outs of making cheddar from his father. Once he took over the dairy, however, sales started to decline slightly, and consultants told him to go modern, which would result in bland, textureless, thoroughly mediocre cheese. Wanting to continue the tradition of his family and maintain pride in his products, Montgomery decided to make traditional cheddar the old-fashioned way, attracting Neal’s Yard’s attention. The difference between his cheeses and most grocery store cheddars is staggering — ranging from bright, puckery, moist cheeses to drier, more caramelized, brothy wheels, you’ll be hard-pressed to find anything else even remotely similar. Second up was a quick trip to see Paul and Sarah Appleby at Hawkstone Abbey Farm in Shropshire. No sooner had we stepped out of the car than Sarah kindly ushered us into her warm, beautiful farmhouse kitchen, the scent of homemade scones wafting from the oven. Along with homemade butter, jam, whey cream, and a lovely cup of tea, we all munched on the delicious pastries and chatted cozily around the large wooden kitchen table. The stately farmhouse had been Paul’s parents home, and his grandparents’ before them. After our languorous tea-and-scones session, we headed into the dairy, which was right next to the kitchen where we had just been. While Paul explained to us how they made their Cheshire cheese — the last farmstead Cheshire in the country — we could see Sarah through a window in the wall, dishing up shepherd’s pie for their five young children. Witnessing such an intimate family scene really brought home the close relationship that these cheesemakers have with their Cheshire, which is subtle and buttery, with a light minerality. 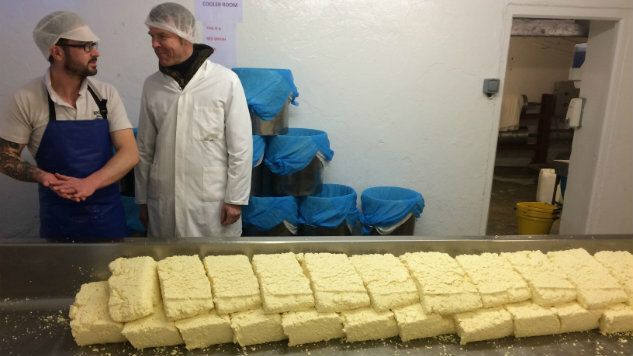 The next day, we were finally allowed get down to work with some cheesemaking of our own at Mrs. Kirkham’s Lancashire. Now run, not by Mrs. Kirkham, but by her grandson, Graham, we were put to work buttering the outsides of the previous days clothbound Lancashire wheels. After slathering the golden, clarified liquid over about two dozen wheels, we were invited into the aging room to taste what our work would eventually produce — three-month old, fluffy, delicate, buttery Lancashire cheese. We were also treated to a bit of an experiment — a delicious year-old wheel. Harder and drier in texture with a much bigger, bolder flavor, like fatty chicken broth cut with a citrusy zip, this cheese was a perfect example of how much age can change a wheel, and how that can expand your market. I assured Graham that this was exactly the kind of harder, more assertive cheese that my American customers typically enjoy. Last but not least was a trip to the famed Colston Bassett creamery in Nottingham, one of only six Stilton producers in the world. Unlike the other dairies that we visited, Colston Bassett is not a farmstead cheese; they use milk from four surrounding farms as opposed to raising the cows themselves. However, the farmers are all part-owners of the creamery and all have a say in what is done with their milk. Billy Kevan, only the fourth cheesemaker at Colston Bassett during its 104 years of operation, showed us how the cheese was made by hand from start to finish. This included the very labor intensive hand-ladling process of moving curds from one vat to another using a small, shallow bowl, which helps gently separate the curds from the whey while maintaining the protein structure and moisture levels in the cheese, and giving the end result a beautiful, satiny texture. And oh boy, what a cheese it is — this was my gateway blue, and with good reason. As Kevan put it, proper Stilton should taste and feel like butter, with just a hint of blue. Too many holes in the cheese, which results in too much blue being allowed to grow, causes the flavor to get aggressive, salty, and bitter. While regular Colston Bassett is exceptional, the wheels that they make specifically for Neal’s Yard Dairy have about a third less holes than their regular wheels. This means that they’re less blue, with more of a focus on the unbelievably sweet, creamy paste, with just the right amount of mushroomy, funky blueness mixed in. Blue-haters: don’t be afraid of this one. Get some right now. The crux of the trip was how deeply personal these cheeses are for those who make them and sell them. With most products in this modern world, there is a fairly circuitous and convoluted relationship between the thing that you are consuming and the people who made it. With these beautiful cheeses, that is simply not the case. These passionate people have their roots, family, identity, and pride all wrapped up in the products that they send out into the world. These traditional cheeses, originally made to simply stave off hunger and nourish the body, are a snapshot of place, and a connection to the past, present, and future of the families who painstakingly cultivate them every single day. And besides, they’re damn delicious. Bad food? I don’t think so.